The Rev. Willie Johnson was a sanctified and holy man who played and sang gospel songs to bring edification and salvation to any lost souls who might hear him. No doubt he would be galled and scandalized if he had lived to see his name included in books and his music in CD boxed sets along with profane and worldly blues musicians, yet his music has been a great influence on blues guitar players from Fred McDowell to Ry Cooder. Blind Willie Johnson was a poor blind preacher and gospel singer who spent most of his life on dusty street corners in dreary little east Texas towns preaching and singing for whatever change passers-by might drop into his tin cup. What we know of Johnson’s life is sparse and partly apocryphal. He was born shortly after the turn of the twentieth century on a farm near Temple, TX. While he was still an infant, his father moved his family to the town of Marlin, just east of the Brazos River. Johnson’s mother died when he was 3 or 4 years old and his father soon remarried. Young Willie was drawn to religion when he was very small, and by the time he was 5 years old he was telling his father that he was going to be a preacher. His blindness happened when he was 7 years old. The most common explanation for this tragedy is that his stepmother threw a pan of lye water in the boy’s face to get back at his father for beating her. However, at other times, Johnson said that he went blind from wearing the wrong kind of glasses or from looking at an eclipse of the sun without protection. In the early years of this century, there were few options for a poor, blind African-American young man in Texas to make a living. Johnson was fortunate because he had an aptitude for music. He had fashioned his first guitar from a cigar box. As he began to sing and play at revival meetings and church services, his music took on a dismal sense of loneliness and despair. When he was still quite young Johnson began going into Marlin to sing on the streets, and sometimes he would go with his father who had a job in Hearn, a town a few miles away, and spend the day playing while his father was at work. Sometime in the early 1920s Johnson married for the first time. The woman’s name was also Willie. Willie Harris. She sang with him on the streets and also accompanied him later on some of his recordings. By 1927 Johnson had wandered up to Dallas and, one day while he was walking along singing, he heard a sweet voice behind him joining in on the old hymn, “If I Had My Way, I’d Tear This Building Down.” The owner of the voice was a young lady by the name of Angeline. She took Johnson home with her, she played the piano and sang songs with him, she fed him gumbo, and she married him eh next day. It is unclear whether the marriage to the first Mrs. Johnson was ever a legally sanctioned union, but it appears that, one way or the other, Johnson had two wives for a while, and recorded with both of them. These records were well received and Johnson was lauded by one critic for his “…violent, tortured and abysmal shouts and groans and his inspired guitar.” These first recordings made by Johnson are generally regarded as his best. Making popular records had little impact on Johnson’s life style. With his wife Angeline, he wandered from town to town, making his living on the streets. Finally, after having their first child, the couple bought a house in Beaumont in December of 1928. They recorded four more sides for Columbia, in Dallas, and the following December, the record company brought Johnson to New Orleans for another session. Angeline did not accompany her husband on this trip, and a lady from a New Orleans church was recruited to sing with Johnson for this recording session. Unfortunately, the woman’s name was not listed on the record label, and she remains unknown. The highly popular and widely imitated “Let Your Light Shine on Me” was one of the sides from the New Orleans session. After he finished recording, Johnson stayed on in New Orleans for several weeks. Blues historian Sam Charters recounts a rather curious incident that happened while Johnson as playing on the streets. He was down near the river, on Canal street, was playing in front of the Custom House and was singing one of his favorite songs “If I Had My Way” which is a retelling of the Sampson and Delilah story from the Bible, and just as he got to the part that goes, “If I had my way, I’d tear this building down”, a policeman happened to walk by. Thinking that Johnson was referring to the Custom House, he tried to arrest Johnson, but, fortunately, reason prevailed and the singer was allowed to go on his way. How the cop thought that a blind man armed only with a beat-up old guitar could raze a massive stone building like the Custom House was not reported. In 1930, Columbia again sought to record Johnson for a fourth and final session, this time in Atlanta. In all, Johnson only recorded thirty sides, but his record sales were equal to the other “race” artists of that time, including Bessie Smith and Ethel Waters. No doubt Columbia would have continued to record Johnson except that, by 1930, the Depression had put the company—in fact, all records companies—in dire financial straits. 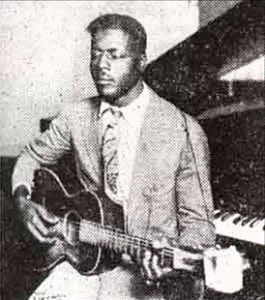 Johnson met Blind Willie McTell, a popular street musician in Atlanta, and the two blind singers traveled and performed together throughout the Southeast for several months before Johnson returned to Beaumont. Even though Blind Willie Johnson’s recording career was brief, and he never appeared in concert halls or before large audiences, his influences has been far-reaching and long lasting, and he will not doubt continue to beguile blues singers and guitar players for a long time to come. Whatever it was that Johnson played, he played it exquisitely. Especially when he was using a slide, he was smooth, delicate, and precise, and yet hard driving. His guitar strings made a second voice, and he often used a technique common to the Delta guitarists—not singing the end of a phrase, but letting the guitar sing it. Johnson’s songs came from varied sources. Some were traditional hymns sung in central Texas churches, some he got from other street singers, others from phonograph records and songbooks, and some he made up. Much has been made of Johnson’s singing style. He had a clear strong voice, but he frequently sang in a rough, raspy, false bass. Often he was so intensely absorbed in the message of the song that the words became virtually unintelligible, dissolving into an emotionally charged chant. The late blues historian Robert Palmer likened Johnson to West African maskers: “The masker was often believed to be possessed by a god or spirit, so his voice had to change along with his appearance. Some masks had mirliton membranes mounted in their mouthpieces, and the maskers sang through them, producing a buzzing timber, not unlike that of a kazoo. After his final recordings were made in Atlanta, Johns returned to Beaumont to live out the rest of his life with his family, making his living as he always had, singing on street corners, churches, and revival meetings for tips from friends and strangers. During the winter of 1949, Johnson’s house caught on fire. The fire was extinguished before the house was destroyed, but his most valuable possession, his guitar, was lost. Angeline spread newspapers over their water soaked bed, but the dampness and cold caused Johnson to develop pneumonia anyway, and he died a few days later. But he’ll never be forgotten. Ry Cooder adapted Johnson’s version of “Dark Was the Night, Cold Was the Ground” for the soundtrack of the moody film, “Paris, Texas.” And Johnson’s 1927 recording of the song was included along with Chuck Berry and Beethoven with other artifacts of our culture sent to outer space in the spaceship Voyager in 1977.